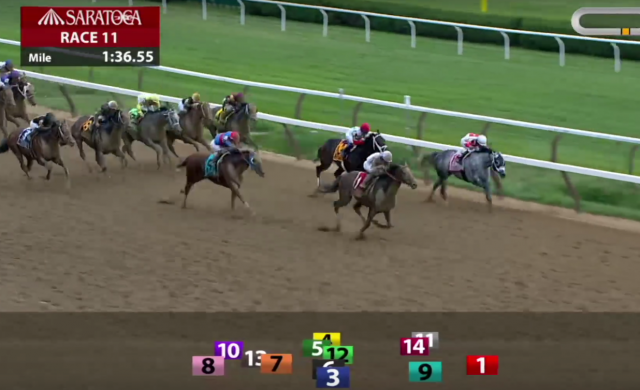 Yoshida, in his first career start on dirt, charged with a thrilling late close to take the Grade I Woodward Stakes on Saturday at Saratoga. The phrase “power vacuum” comes to mind when one thinks about the current racing season: Justify, the indisputable king of the Triple Crown, retired just a few weeks after the Belmont Stakes, leaving a big gaping hole in the racing world with no apparent successor to his unchallenged reign. Who is the new top horse on the dirt? Who will be the favorite going into the year’s highlight race, the Breeders’ Cup Classic? In a wide-open field, Yoshida has become the latest to throw his hat into the ring… all the way from the turf track. Bred in Japan, Yoshida is by Heart’s Cry, a son of Sunday Silence, and his most recent victory came in the Grade I Old Forester Turf Classic Stakes at Churchill Downs. Trainer Bill Mott, under owners WinStar Farm LLC, China Horse Club International Ltd., SF Racing LLC and Head of Plains Partners LLC, knew that he wanted to try the four-year-old on dirt, but didn’t have a specific race in mind… until a convenient lack of good turf starts plus a lack of standout favorites in Saratoga’s Woodward Stakes presented themselves to help make the decision a little easier. Knowing now how Yoshia likes the dirt, it remains to be seen: will he be a probably entry in November’s Breeders’ Cup Classic? Or will he return to the turf? The field is wide open.